Excerpted from Fr. Richard O'Keefe, O.P. St. Jude was not only a follower of Jesus but his friend as well. His close relationship to Jesus not only changed his life but also made him a powerful advocate on our behalf. From Jesus he learned about God's boundless compassion and infinite power. He learned not to doubt God's wisdom but confidently to trust divine mercy. Sometimes our suffering can make us forget, even despair of, God's love and provision for us. We ask, "Why has this happened to me? Where is the Lord when I need him?" We might even wonder whether He hears our prayer. 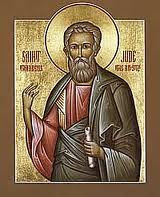 We go to St. Jude because we believe that he is a man of faith and understands that nothing is impossible for God. From Jesus he would have learned this. He believed what Jesus had told him at the Last Supper: "If you ask for anything in my name, I will do it." (John 14:14) He heard Jesus say, "...with God everything is possible." (Mark 10:27). And, harkening to those words, we ourselves regain our balance; we find the strength to go on trusting in God's wisdom and mercy.